Laura Ellen Scott, a friend and fellow professor at George Mason University, celebrates the release of The Juliet, her second novel, this week—and I’m honored to be celebrating with her! 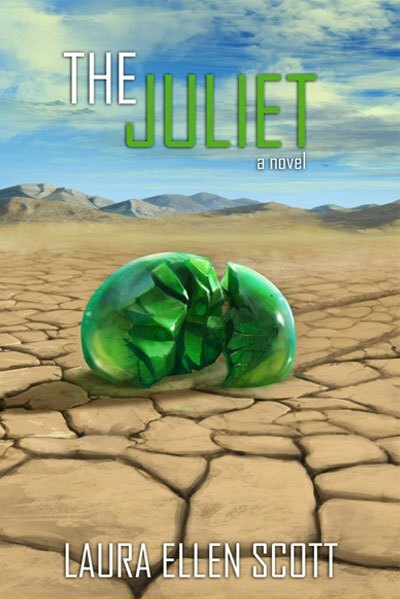 THE JULIET is a novel that braids the history of a cursed emerald called The Juliet with the story of an ailing, retired cowboy actor who comes to Death Valley to search for her. Rigg Dexon, best known for his role as Holt Breck in the classic but controversial seventies Western, Gallows River, holes up for months in a shack known as the Mystery House, until he is driven out of seclusion by the record breaking wildflower bloom of March 2005 that draws swarms of tourists to the desert. After an intense encounter with an ardent fan named Willie Judy at a local bar, Rigg impulsively signs over the deed for the Mystery House to her in a gesture straight out of one of his corny films. But Willie, a rootless, unlucky young woman from a family of short-lived dreamers, takes it as a sign: Dexon wants her to find the Juliet, now that he’s too frail to continue his search. What Willie doesn’t know is that Dexon is giving away everything that’s precious to him, following the advice of Holt Breck: leave like you ain’t coming back. When Dexon’s gift turns out to be the scene of a crime that implicates Willie in drug trafficking, she tries to cover it up, only to be drawn into the chaotic wake of The Juliet. Interspersed with the story set in 2005 are episodes from The Juliet’s twisted history as the emerald changes hands over the span of a century, leaving a wake of murder, theft, and madness until she is seemingly lost in the 50s. However, when a 1970s cereal company promises that the prize inside the box is a fragment of a treasure map that might lead to The Juliet’s whereabouts, her legend is re-ignited, helped in no small part by the cereal’s spokesman, none other than Rigg Dexon. Looking forward to seeing many eager readers at events this week!